Madrid, on a cold January morning. I come out of my hotel, superbly located in the fashionable Salamanca quarter. I cross the street and enter the coffee shop. Sitting at table in a corner I see my friend Bea and her husband, Arturo Fuentes the writer, whom I’m meeting today for the first time even if I’m already his reader and follower on Facebook. Bea and I have been friends for years. We met professionally but now really enjoy being together, talking and sharing our ideas. Some two years ago she confided in me that her husband had begun writing after his pre retirement; that’s how I came across Arturo’s first book that I mentioned in my post “Back to the mysteries of Scotland”. I was curious and bought the book on Amazon and found it simply unputdownable. It’s a thriller set in the Scottish Highlands, mixing suspense with the supernatural. I was amazed at Arturo’s mastery of the plot and at the time wrote to him saying I was looking forward to reading the second book of the series. As soon as Bea mentioned the second book was on Amazon I bought it but could not begin it immediately as I was reading Michelle Obama’s autobiography at the time. I put Arturo’s book by my bed, though, and longingly looked at it as I knew it would certainly be a very interesting read. Meanwhile I had a business trip to Madrid and told Bea it might be a good opportunity for us to get together and for me to finally meet Arturo, and we agreed to have breakfast together. Bea and I are always happy to see each other and with Arturo it seemed we had known each other for a long time. After all, I read his books and he reads the stories on my blog, so somehow we do know each other. Still, it was good to be there, face to face, and soon the three of us – as Bea is enthusiastic about her husband’s work and not only follows my blog but is looking forward to reading my book – were enthusiastically discussing books and stories and publishing; and, of course, talking about Arturo’s new book “Tambien los demonios miran al pasado” (in English, literally “Even demons look back to the past”). He mentioned he had chosen to self-publish on Amazon – something I intend to do myself – which was not the case of his first book and he’s really happy with the result. His first book’s publishing house was a small one but even so he has been on several TV interviews and has won a few literary prizes. He has also been recommended by several Spanish book blogs, being on his way to become a famous author; in addition there a possibility of a TV series. I told him he must have his book translated into English as this would of course hugely enlarge the scope of his readers and he is considering it. Arturo also mentioned he is already writing his third book and doing research for others, and I suggested he and Bea come over to stay at my beach apartment near Sintra. Sintra is a lovely small town on a mountain 30 kilometres from Lisbon and not only it has a mysterious aura – no doubt enhanced by the ever present mist that makes for an eerie atmosphere– but it is said to be a very ancient and mystical place; locals say even today witches get together in its forests, where the remains of dead animals and suspicious objects speak of strange rituals performed there…and I believe there must be many legends related to Sintra that might serve as inspiration for one of Arturo’s stories. Back home I finally opened his second book and soon I was engrossed in the newest adventure of James Allen, a history teacher turned investigator. In the first book he teams up with Patricia Banner, a young Scottish police officer and Collins, a former hacker who has mended his ways and now helps the police. From the beginning they work together to solve the mystery around some very odd murder cases in a Highland marshy area. But this book is quite different from the first; the story begins in Tuscany, Italy, where James Allen currently lives with his fiancée, Victoria, a beautiful woman he has met and fallen in love with during his first adventure. Suddenly the theft of an old artefact unleashes a series of events that will take us from Italy to Buenos Aires and to a mysterious island in Greece; we will time travel to the 16th century and the Amazon rainforest and walk with the Spanish conquerors as they move into the deep jungle and acquaint themselves with Indian old myths and legends, some of them utterly terrifying like that of the Yamapuma, a black demon that kills its victims by chopping off the front part of their heads and leaves them without a trace of blood on their bodies. This old curse will travel across the world to an island in Greece where ancient rituals are revived and the population lives in a state of terror not daring to tell anyone about their terrible secret. When James and Victoria decide to get married on the island of Gavdos – where she has a family home – they invite their Scottish friends to come over for the celebration. Patricia and Collins get together with Chief Inspector Alex Scot, his wife and two children to travel to the island hoping for a nice wedding and a few relaxing days in the sun. However, as a terrible storm hits the island things go horribly wrong. It seems as if ancient dark forces are gathering. People are disappearing and old rites are being revived. A monster is on the loose and James and his friends will have to fight for their lives as they try to put an end to the old curse that hovers above the island. Bea and Arturo told me some of his readers did not enjoy this book as much as the first one. I, on the contrary, think this book is even better than the first. Maybe it’s not as easy to read but I find it superbly written. Moreover, it is not a mere copy of the first, changing only a few items such as the legend and location and little more. Even if it is the second adventure of a group of people we already know, the pace of the story is totally different, as is the way it unfolds. In this book James Allen does part of the investigation by himself, just because circumstances justify it. As for the outcome, I’m afraid to say there is no happy ending. This book is definitely darker. With all the rain and dark skies of the storm Arturo makes a Greek island seem even creepier than the Scottish marshes. He actually does it, turning the whole story in something scarier, more terrible. So maybe it’s not an easy or conventional story but the plot is woven in such a way that you won’t put down the book unless you really have to! I found myself reading unto the late hours of the night because I simply had to know what happened next. In the end, with this new book, Arturo not only manages to keep up to the – already high – expectations he had created with his first, but he surprises us as well, by giving us the continuation of James’s adventures in a completely different story, with an unexpected climax that leaves us truly shaken. But then, real life is not about happy endings, and neither is this book. I’m sorry this book is not published in English yet for I would strongly recommend it to you. But I promise you this: I’m positive that, sooner or later, Arturo’s books will be found in English. And when they do I will let you know so that you may all enjoy them. To Arturo, I say, please go on writing. You have an amazing imagination. How you could describe the island of Gavdos in such detail – we feel transported there – without ever having been there I cannot tell. But then, that is the stuff of a great writer, to make his readers feel real emotions and see real places. Thank you so much for great reading moments, and please don’t take too long to write the next adventure as your fans – myself included – can barely wait. I have read much about Scotland and have travelled there twice, so I feel I am well acquainted with its folklore, but I have recently learned about a new legend of the Highlands, that of the “water demon”, or, in Gaelic, each- uisge. This creature is described as a water horse that appears on the shores of lochs (Scottish lakes) and whispers in order to attract its victims. When mounted by humans, it takes them into the water and devours them, throwing the entrails onto the shore. Strangely, I came across this most Scottish of creatures in a book by a Spanish author, Arturo Fuentes. His is also an interesting story: in his early retirement, he decided to write a book, and if I’m right he has found a new career. He has written an amazing book, a thriller that combines history and modern times, crime and supernatural, all taking place in the beautiful, at times eerie, but always mysterious Scottish Highlands. 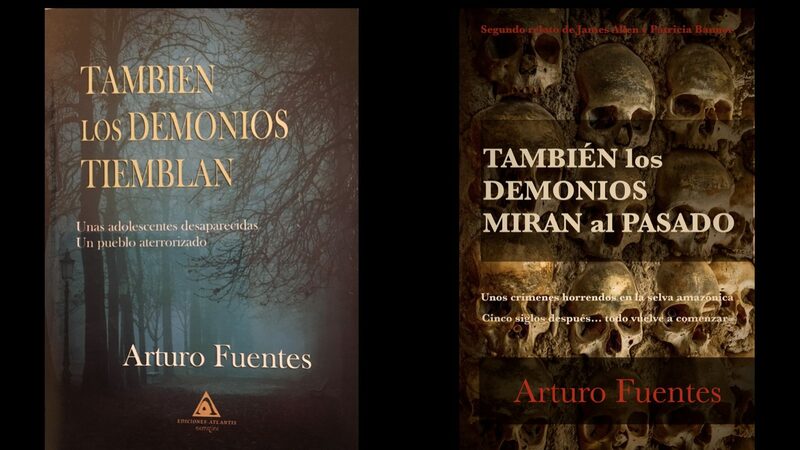 In Spanish the book is called “También los demonios tiemblan”, literally meaning “Even the demons tremble”, so it’s quite suggestive, as is the cover. And when you begin reading it really enthrals you – I had this feeling that I didn’t want to put it down so that I might learn more, but at the same time I was enjoying it so much I didn’t want it to end. I had to finish reading it of course, but I went back for more details, for another glimpse of the story. The story unravels around the disappearance of four young girls in a swamp area around the town of Locharron, in the Highlands. No trace of them is found but for the heart and other entrails near the place where they were last seen. The people in the area are terrified and say it’s the work of “the one who whispers”, meaning the water horse or each uisge. The police begin to investigate and they ask for the help of a marine archaeologist, James Allen, who happens to be on holidays in the area – where he was born – who teams up with a young police agent, Patricia Banner and a white-hat hacker who goes by the name of Collins. As the synopsis goes “they will be drawn into a fierce fight against evil, local superstition and the lack of cooperation of the local authorities. In order to get to the bottom of this strange case and defeat a dark opponent, Allen and Banner will have to find the connection between the heinous crimes, the Celtic legend of the “water demon” and a macabre object built in the XVI century”. The description of the mysterious landscapes is so vivid I’m sure the author must have toured the Highlands at some time. He actually takes us there, and it is almost as if we feel the mist invade us as we guess the whispers of the water demons in the distance and glimpse its haunting shape on the shore of a loch. Having been to Scotland’s lochs I am not surprised they give rise to so many legends about strange creatures living in their depths: the waters are dark, pitch black in some cases as those of the Loch Ness. When I sailed its deep waters I was in awe as at any moment I expected the Loch Ness Monster to jump out of them and show itself! But then, that is the magic and allure of Scotland, especially in the Highlands. A tough land, with a harsh climate, steep mountains and deep valleys, dark forests and green fields and the ever present mysterious lochs. Not to mention the old castles, most of them with their very own ghosts – and it’s this combination of scenery and folklore that makes Scotland a unique place in the world. So remember. Next time you find yourself in the Scottish Highlands touring around the lochs, beware of a fine horse standing on the shore with an inviting look for you to ride it. If in addition you start hearing whispers drawing you to it, run for your life, for it will certainly be the creature Arturo Fuentes tells us about. I’ll certainly have that in mind, and in the meantime I’ll try to persuade Arturo – whose wife is a good friend – to have his book translated into English, so that you may all read it – it’s definitely worthwhile. For the time being, unless you speak Spanish, you’ll have to do with this post. A final word to congratulate Arturo on his splendid book, and to ask him to start writing the new book of this series, as I know is his intention. I can’t wait to see where Allen and Banner’s adventures will take us next! Hola a todos y a todas. Hoy os traigo la reseña de una novela llamada También los demonios tiemblan de la Editorial Atlantis a la cual agradezco su envío. A pesar de la extensión de la novela os puedo asegurar que me ha enganchado tanto que en tres días la he devorado. La narración es muy fluída y los capítulos divididos en partes son cortos lo que hace que no te canses tanto. Los personajes me han gustado mucho, cada uno de ellos con su personalidad propia y muy bien descritos. Mis favoritos han sido Patricia y James aunque el informático también por su gran inteligencia y uso de los ordenadores. En conclusión esta ha sido una historia muy completa de una investigación policial donde se une lo real con las leyendas y que le aporta ese toque misterioso a cada una de las páginas. Me ha mantenido enganchada a la trama hasta el final y eso lo considero algo muy positivo así que por ello mi puntuación es la siguiente. La historia comienza con la muerte de cuatro adolescentes de edades comprendidas entre los doce a los diecisiete años. El policía recién ascendido Alex Scott está al mando de la investigación pero su superior le dice que el caso no es de su jurisprudencia y le releva el caso a Patricia Banner, una policía novata que hará todo lo posible por resolver el caso, y a un hacker informático igual de joven que Patricia pero un maestro en la informática. El caso es de lo más desconcertante y es que en las Tierras Altas de Escocia existe una leyenda que se encuentra dentro del folclore tradicional que nos habla acerca del Demonio del agua o El que susurra y que aparece por las noches en los ríos y ciénagas del lugar. Todos los que viven en la zona están convencidos de que a las jóvenes las mató ese ser ya que se han encontrado huellas extrañas y a las víctimas se les ha arrancado el corazón de cuajo y otros órganos. Otro de los protagonistas que entrará en acción en esta historia es James Allen, mejor amigo de Alex Scott y que es arqueólogo marino. Días antes ha estado enfrascado en una investigación en medio del mar Mediterráneo y es que un buque insignia muy antiguo y abatido ha sido descubierto y se dice que dentro hay documentos muy importantes que firmó el mismísimo Napoleón Bonaparte. Después de un intento de asesinato James decide volver y es cuando Alex le comunica el caso de las chicas asesinadas. James al ser profesor de la universidad conoce todo lo relacionado con el folclore y las leyendas escocesas así que como tiene procedencia escocesa va a la casa en la que vivía con sus padres y lleva con él al informático y a la policía Patricia Banner para ayudarlos con el caso. Muchas historias se mezclarán las unas con las otras teniendo sentido finalmente en los episodios finales. La mayoría del libro trata acerca de la resolución de este interesantísimo caso en el que se pone en tela de juicio lo que las gentes del lugar piensan y dicen que han oído (susurros en la noche) y el raciocinio que a Patricia y James les dice que no ha podido ser un demonio sino un hombre de carne y hueso. También los demonios tiemblan, es una historia desarrollada en un lugar paradisíaco, misterioso y místico como son las tierras escocesas. Me ha llamado mucho la atención la portada y la sinopsis, aspectos que me impulsaron a leerlo. La novela se lee muy bien, es ágil y fresca. Atrapa al lector desde un primer momento a pesar de que a veces te deja un poco intrigado y con la miel en los labios al cambiar de escenario. Son algo más de quinientas páginas, pero a pesar de que es bastante extenso, te deja con ganas de más para seguir disfrutando del misterio que envuelve la trama. La población escocesa de Lochcarron, con zonas pantanosas aledañas, está atemorizada por unos hechos espeluznantes que están sucediendo. Han aparecido las vísceras de cuatro jóvenes, los lugareños creen que detrás de todo esto anda “El que susurra”, un espíritu, que según los lugareños vive en los lagos. James Allen, es un arqueólogo marino y Patricia Banner, es una agente novata de la policía escocesa. Ambos deben hacer frente a varias cuestiones; por un lado a las supersticiones de los lugareños, y por otro lado a la escasa colaboración de las autoridades. Juntos tienen que resolver el rompecabezas y la conexión existente entre los diferentes crímenes tan atroces. Existe una leyenda celta del “Demonio del Agua”y un objeto macabro construido en el siglo XVI. Una novela trepidante, que te atrapa y te cautiva, ideal para pasar unos ratos inolvidables de lectura. Aconsejo la lectura de este libro a todos los amantes de las aventuras y leyendas. Escritor y periodista, es crítico de cine y teatro y miembro del Consejo de Redacción de la revista Mirador. Colaborador de distintas publicaciones como articulista, ha escrito y publicado varios libros de poesía y narrativa, entre ellos el recientemente galardonado con el Premio Blas de Otero, Corales. En 2013 apareció una Antología personal con el número 8 de la serie Hazversidades Poéticas. También ha ejercido la actividad docente como profesor de Literatura en Inglaterra. Además, ha residido durante diferentes períodos en Estados Unidos y Australia, lo que le convierte en un buen conocedor del mundo anglosajón. En otros terrenos, como el publicitario, es autor del nombre y logotipo del AVE. Ha sido jurado de los Premios Calderón y Villa de Barajas de Teatro y, actualmente, es Vicesecretario de la Asociación de Escritores y Artistas Españoles. «Los brutales asesinatos de varias adolescentes y jóvenes en distintos lugares de las Tierras Altas, destinados a sembrar el terror entre sus habitantes, obligan a la policía a intervenir para detener la cadena de crímenes. Patricia Banner, la agente encargada del caso ayudada por su equipo de expertos y el asesoramiento del historiador James Allen, se ven envueltos en una encarnizada lucha contra el malvado asesino, las supersticiones locales y la complicidad de las autoridades civiles y eclesiásticas, empeñados los policías en restablecer la verdad que había alterado la convivencia en paz de las gentes del lugar. «Nos encontramos ante una obra que conjuga diferentes géneros como son la novela fantástica, gótica y policiaca. A la par, también hay ciertos tintes de mitología e Historia, por lo que con tales ingredientes, el autor ha sido capaz de hilvanar una increíble confluencia de géneros. Además, hay que tener en cuenta ciertos momentos que contienen un gran lirismo y que narrativamente, son casi poéticos. Esto, en contraposición con “la criatura”, leitmotiv del libro y nexo conductor en la trama, otorga un grado de oscurantismo, sumado a la mitología celta, abarcando varios siglos hasta el momento actual. Desde nuestro punto de vista, a lo largo de sus páginas (en ese sentido es extensa, pero muy rítmica), los distintos personajes que aparecen a lo largo de la obra, tanto los principales como sus antagonistas, se encuentran claramente identificados en todo momento, algo importante de cara a una lectura clara y al entendimiento de las relaciones interpersonales entre ellos. En ese aspecto, los perfiles psicológicos de cada personaje, quedan bien definidos, poseen una amplia gama de matices y no son en absoluto planos, sino todo lo contrario; cara a la construcción poseen una gran riqueza de detalles y matices que causan un efecto de cercanía hacia el lector. Cabe destacar también la originalidad en la construcción, lo que hace de este libro un texto interesante. Además, posee un ritmo en su medida justa, produciendo agilidad en ciertos momentos y ralentizando la acción en los instantes adecuados. En cuanto a la técnica narrativa, se combinan curiosas descripciones, contextualizaciones y diálogos. Mientras las descripciones sirven para escenificar lugares, recrear escenarios y dibujar personajes, las explicaciones llevadas a cabo en cada momento son necesarias para contextualizar los acontecimientos y ponernos en situación. Además, las descripciones mencionadas, dependiendo del momento y con distinta intensidad, nos permiten conocer al detalle tanto lugares como características de los personajes pudiendo imaginar de una manera más precisa la escena, algo muy importante en este tipo de género literario, donde si se sobrecarga al lector con párrafos interminables, puede llegar a abandonar su interés, cosa que en este caso no sucede. Por otra parte, los diálogos se han insertado en su momento justo y en la cantidad necesaria estableciendo con claridad las conversaciones entre los distintos personajes, además de dinamizar la lectura. Respecto a las diferentes atmósferas y subtramas, quedan bien delimitadas, creo que no han quedado cabos sueltos y en general, la línea argumental considero que está lo suficientemente elaborada. Además, tiene los ingredientes necesarios para atraer a un lector potencial dentro del género que se ha tratado. Por nuestra parte, decir que ha sido un libro curioso, de una temática muy peculiar que ha llamado nuestra atención. Merece la pena que sea publicado.